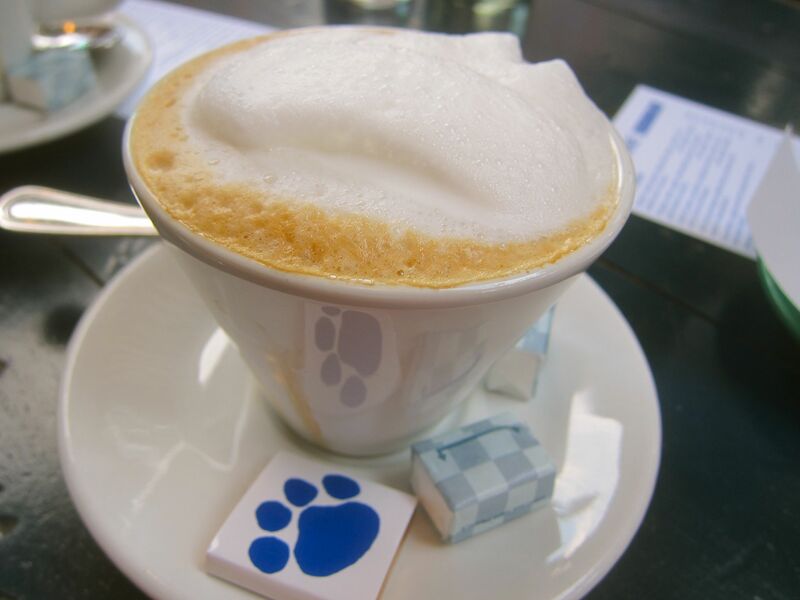 Author Wandering TashPosted on June 6, 2013 March 23, 2014 Categories NY RestaurantsTags Australia, Bucket List, SydneyLeave a comment on Hooroo New York, G’Day Sydney! Urban jungle getting you down? Elbows sore from fighting through the Manhattan sea of humanity? Just wanna see some trees? Fear not, for Brooklyn is but a hop, skip and an L train ride away. Last Friday, with friends visiting from London and Philly, we headed over to Williamsburg for a propuh night out. First stop: the Gutter. If you’re tired of paying an arm and a leg to listen to cheesy house music and eat artery clogging pizza at Chelsea Piers, the Gutter is a refreshing change of pace. Eight lanes, $3 shoes and just $45 to rent a lane for a an entire hour on weekends. We snacked on disco fries (yum) and drank beer while indulging our my poor bowling skills. A few pitchers later, we began walking over to Zenkichi. The quiet, tree-lined streets we’d crossed earlier were now swaying to the rhythm of canvas-toting, sandal-wearing Brooklyn hipsters. We passed bars, clubs and even the occasional all-night bookstore (what?) 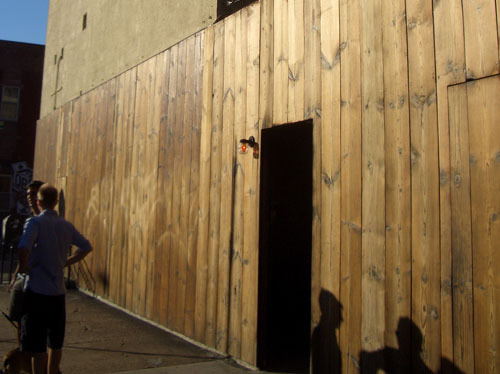 before arriving at our destination – a giant warehouse, boarded up with what looked like planks of wood. Welcome to Zenkichi. 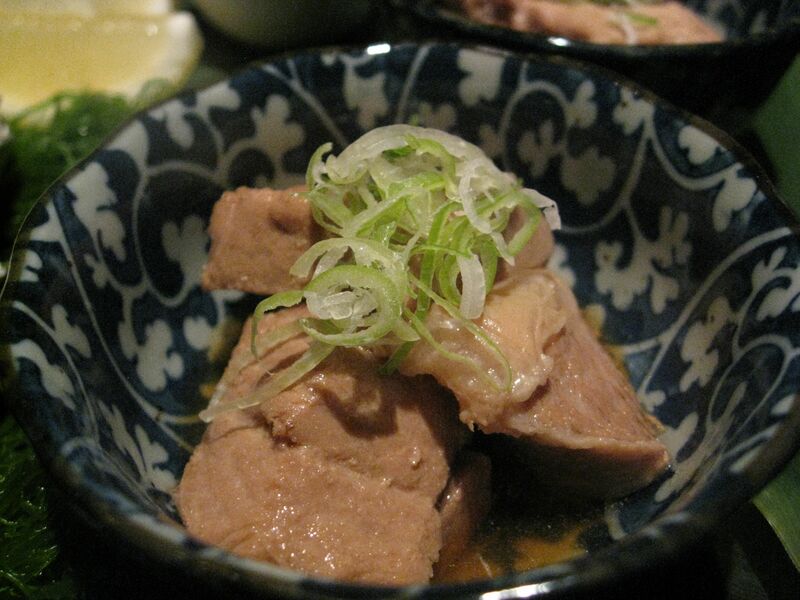 Opened in 2006 by a homesick Tokyo native, Zenkichi describes itself as “a modern Japanese brasserie providing an authentic dining experience of popular Tokyo establishments”. I’ve never been to Tokyo, so I’m not the best person to opine on its authenticity, but if the ambience is anything to go by, you’ll feel as far away from the urban jungle as possible with a 20 minute train ride. The entryway is dark and cave-like, the hostess is Japanese. She politely enquires if any one in our 10 person party is pregnant or under 14 (children are not welcome) and then introduces us to our waitress, who smiles and begins guiding us carefully up a lantern-lit staircase. 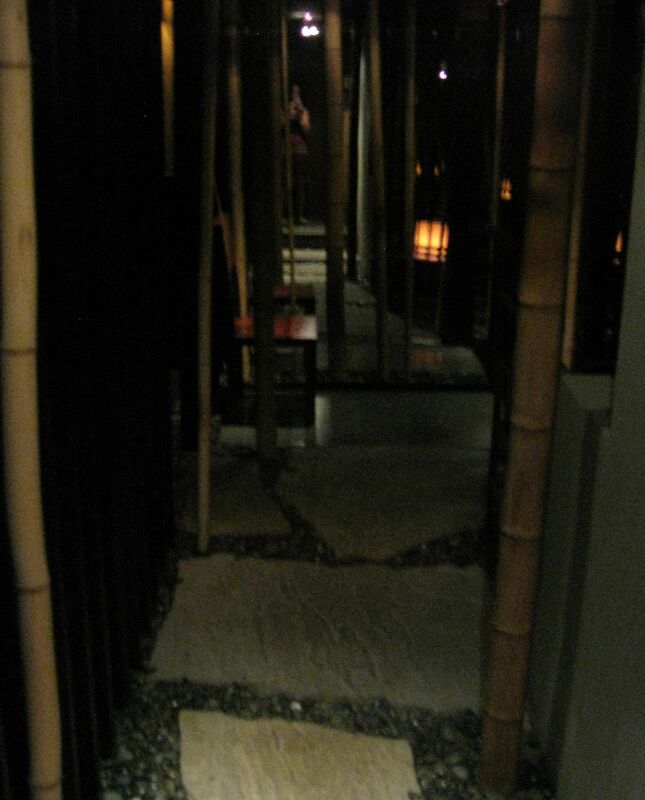 The walkways are strewn with pebbles, sectioned off by mirrors and punctuated, of course, by bamboo stalks. The dim lighting, abundant foliage and babbling of moving water will lull you into a dream-like state, making you think, for an instant that you’re in some sort of secret lair – a maze leading to a Bond movie rendezvous. Our table, like everyone else’s was cloaked in bamboo curtains, secluded but by no means isolated. A tiny button at the end of the table could summon our waitress should we need her. Exciting, if you’re into that sort of thing. If you google “Zenkichi” you will find that a lot of foodbloggers, magazines and food critics have written about the place. 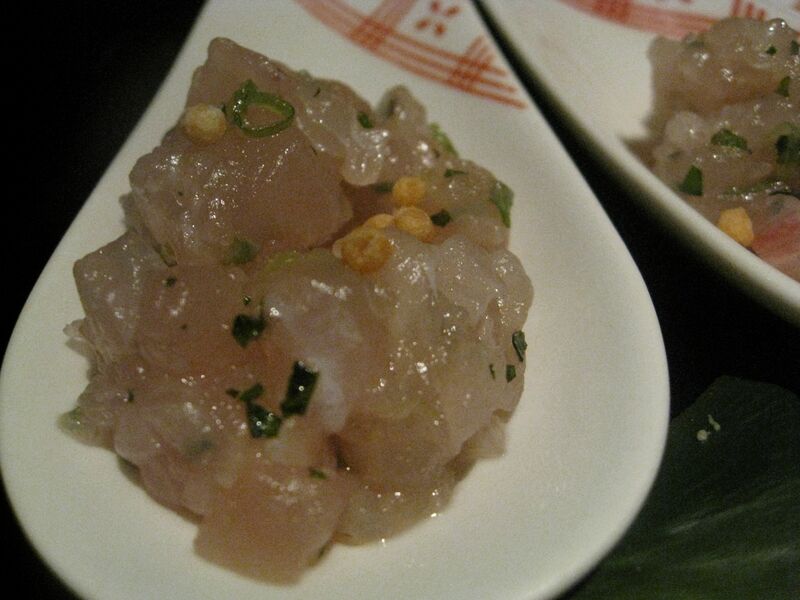 It’s a favorite amongst Japanese food purists and amateurs alike. I will not, for that reason, spend a lot of words on the food, but I will strongly recommend getting the omakase, the chef’s tasting menu. Thrust upon us for being such a large group, the omakase costs $55 and comprises eight unique courses – absolutely fantastic value. 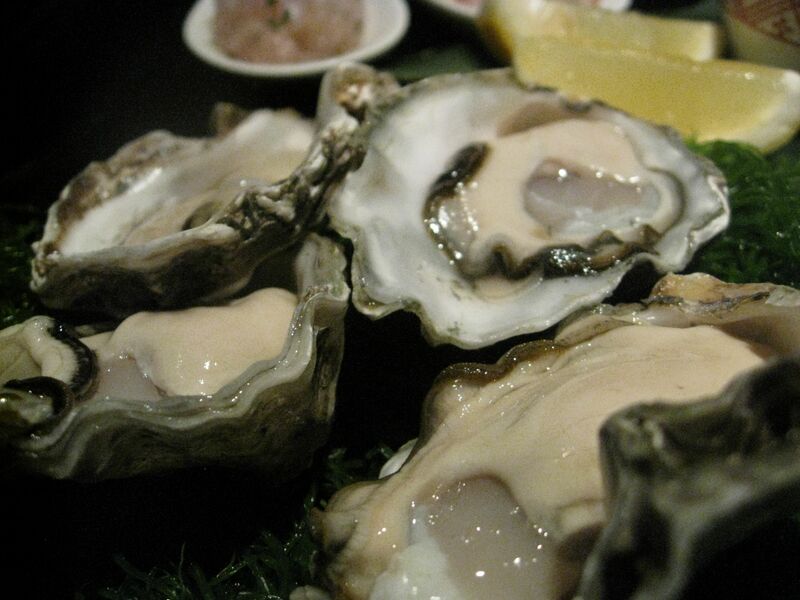 Over the course of 2 hours, we slurped oysters (fresh and delicious), munched on vegetable tempura, sampled the signature Zenkichi salad and tucked into the silky richness of the famous miso-glazed cod. Being a traditional Japanese brasserie, Zenkichi does not serve any sushi which can be a tad disappointing if you’re looking for your Saturday night sushi fix. That said, the variety of dishes was impressive and while portions were small, the meal overall was very filling. 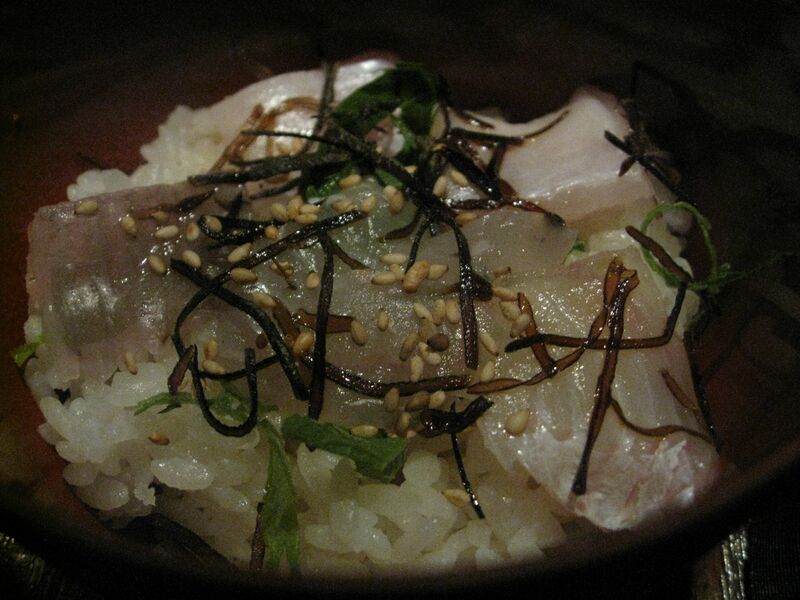 Some dishes, such as the duck (too tough) and the yellowtail sashimi on rice (I needs more vinegar!) were mediocre but, overall, the food was very good. 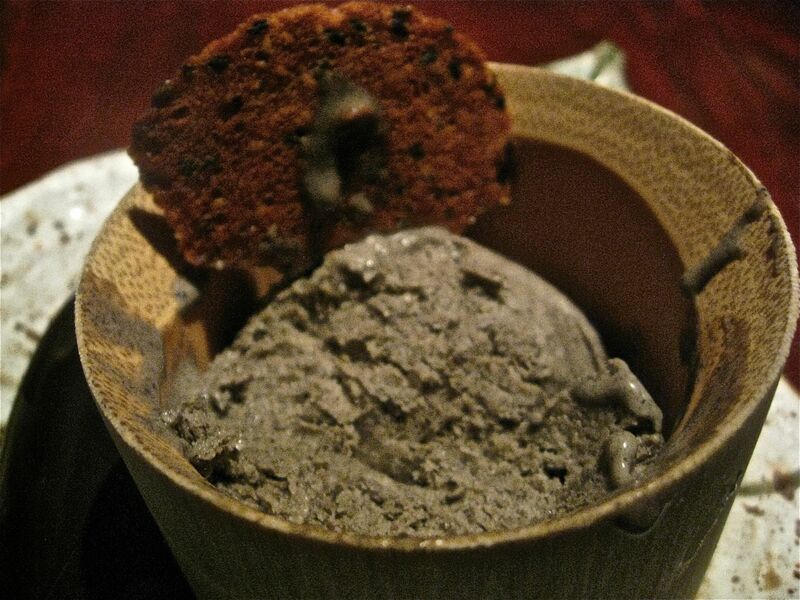 The slew of sakes, variously described as “earthy”, “rich” and “fruity”, perfectly complemented the dishes and the desserts (try the black sesame mousse) were interesting enough for us to sample despite being stuffed. We also received a tray of complementary truffles as a “second dessert” which we were all too full to partake in. Zenkichi was really interesting and different and cool. 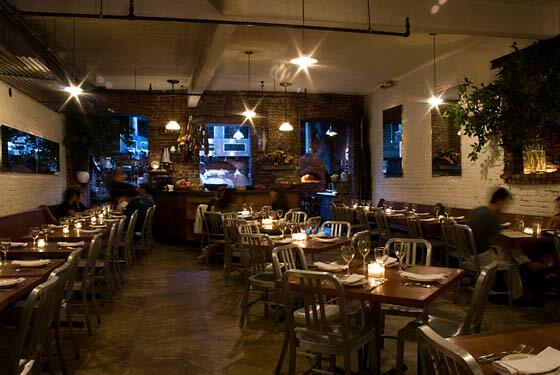 It’s a great place to take your out-of-town friends because it has that “wow” factor people come to New York for, as well as the authenticity that every foodie likes to brag about. The stellar ambience however, perhaps unfairly, generates sky high expectations for the food. 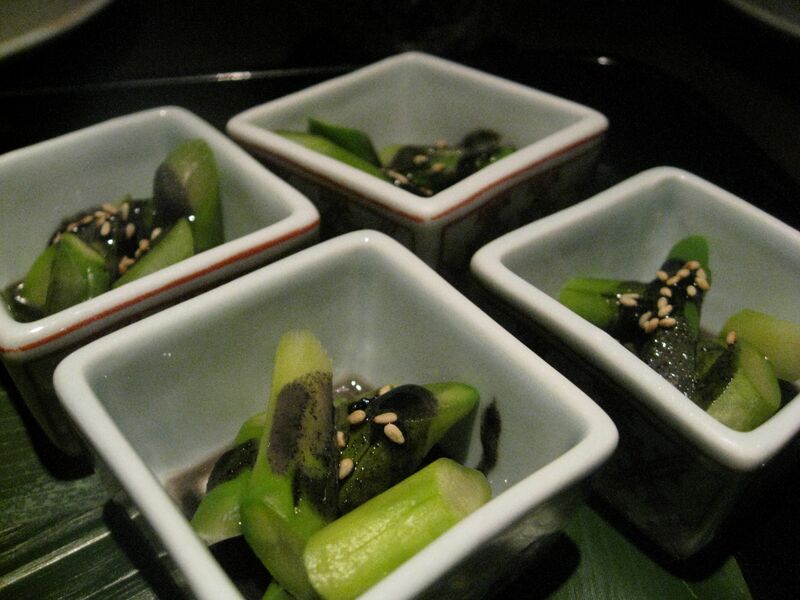 While nothing is terrible, some of Zenkichi’s dishes are mediocre and the Omakase, I thought, could be more creative. Maybe I need to develop my Japanese purist palate since a lot of foodbloggers absolutely gush over this place but, for now, I’m reluctant to give it the same sort of rock solid recommendation as some of the ol’ favorites. Damage: $98 including tax and tip, for the Omakase ($55) and a lot of sake. Earlier this week, the bf and I met up with his friends for our monthly dinner. As is typical of these reunions, there was a long list of requirements on the restaurant choice, not least of which involved the food. Despite my usual reluctance to use Open Table, I briefly resorted to it, before finding a 9pm table at Peasant. Having walked by it several times, I knew that Peasant was set in a beautiful space. The entryway is small and the restaurant itself slightly recessed. The floor to ceiling windows offer a great view onto a cute, neighbourhoody street while the red brick walls, stone floors and dim lighting create a warm aura of rustic Italian charm. Peasant is much bigger than it looks from the outside and if you walk past the well-stocked bar, it opens up into a cavernous space with an open fire kitchen and many tables. The clinking of wine glasses and the euphony of happy dinner chatter help create a lively ambience without being too loud. Perfect. Service continued to be slightly slow but we enjoyed our appetizers of razor clams, spring vegetables and a bocconcini salad. The entrees were a little more mixed. 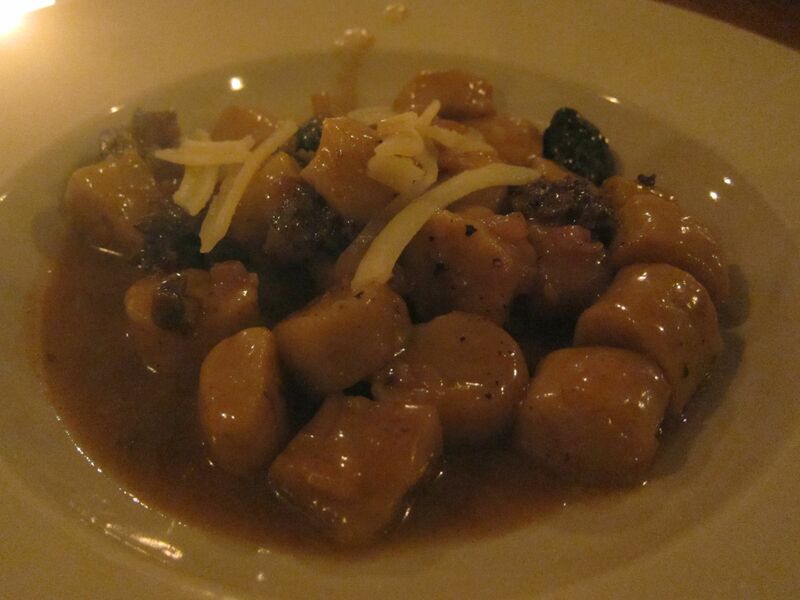 The gnocchi was good but a bit one dimensional and slightly doughy whereas the lamb con polenta was a disappointment. 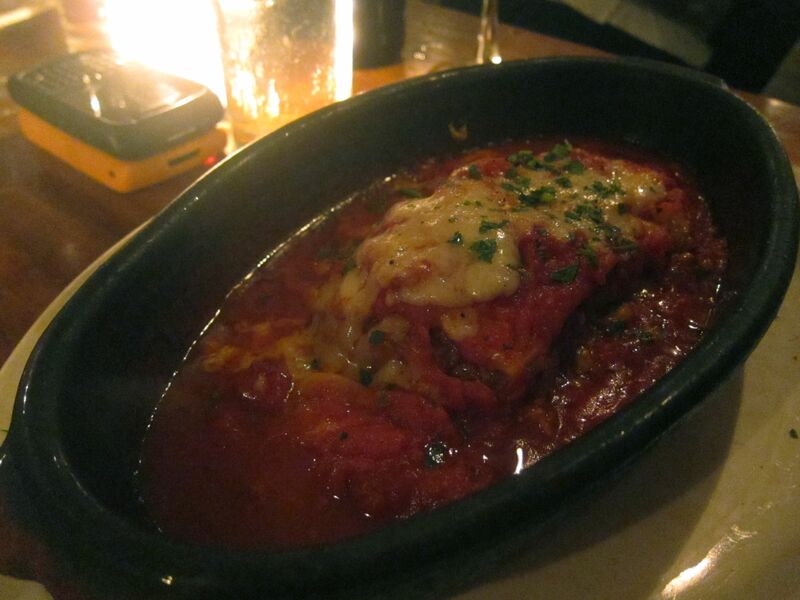 The lasagne con capretto was absolutely delicious and easily the best dish of the night but, when your best entree is the lasagne, something isn’t right. The portions are large, but we’d saved some room for dessert and ordered the hazelnut gelato and a cheesecake. The gelato was good but the cheesecake not really edible. Hmmm. Not really sure what to recommend here. This is another place I really wanted to like but the food was a little underwhelming (especially given the expectations generated by the outstanding ambience and “open fire” cooking) and the service was iffy. I would go back and maybe try some different dishes, drink some wine and sit near the window. But if you’re looking for a guaranteed fantastic meal, this is not your place. Damage: $270 for four with drinks. Other: Interestingly, Peasant has been around for nearly 10 years. That’s like a lifetime in New York restaurant time! A lot of the rave reviews it’s received pertain to another era so maybe it’s moved south over time. Double Crown and I have a love-hate relationship. At the best of times, we’re comrades in arms, partners in a Hendricks and cucumber crime, curious mashups of Brit love and commonwealth character… at the worst of times, we’re the most unpleasant kind of neighbours – civil, but wholly indifferent. Living, as we do, two floors apart, it’s hard for me not to have an opinion on Double Crown. Unfortunately though, it’s not an entirely consistent one. Menu: First off, I love the menu. 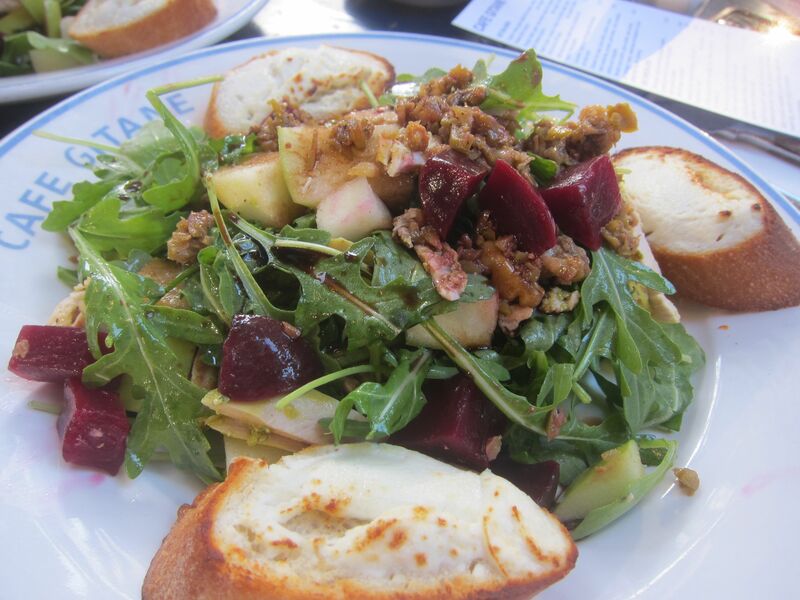 Executive Chef Brad Farmerie has done an outstanding job and his blog is well worth a visit. 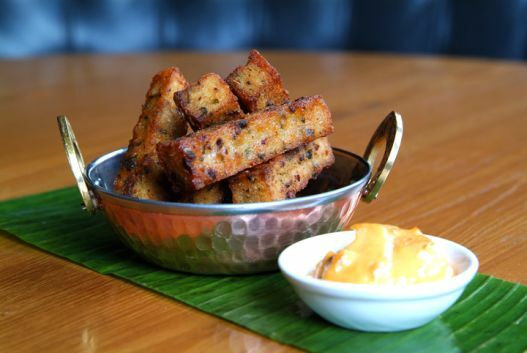 The broad theme has been described as “Colonial inspired South East Asian” and if you think that’s a mouthful, you should try the food. Imagine a bold collection of flavors, colors, textures and cultures, artfully tied together in a fusion of the familiar and the unknown – it’s truly an adventure for the palate. The menu draws influences from a number of different cuisines, including Indian, Cantonese, Japanese, Singaporean, Szechuan and yes, British. The result is a surprisingly fantastic ensemble of creative and beautifully executed dishes. I’ve enjoyed many a dinner party, devoured multiple brunches, downed countless cocktails and even nommed several afternoon appetizers at Double Crown. My top three favorite dishes are the Singapore Laksa, the Roast Pork Belly and the Duck Steamed Buns. These easy-to-make, tough-to-master dishes are flawlessly prepared at Double Crown and are garnished, enhanced and flavored with an amazing set of herbs, spices and other touches that make them uniquely outstanding. Ambience: The second big thing to note about Double Crown (and this could be a plus or a minus, depending on your mood) is that it is incredibly trendy. The AvroKO designed restaurant space oozes edgy character. An outdoor “garden” of white picket tables and planters decorate the entrance and work perfectly with the crazy busy, but also crazy beautiful, Bowery sidewalk to create a gastropub feel. 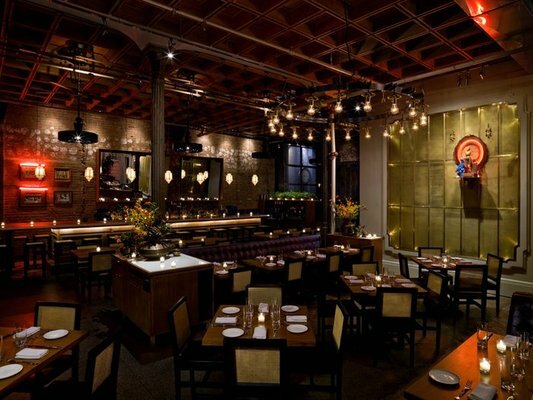 Step inside and you’re greeted by a gleaming bar to your left and a maze of beautiful mahogany tables to your right. On a typical evening, the dark interior is punctuated by splashes of candlelight, glowing lanterns and Robin Hood-esque chandeliers. The effect is a mix of intrigue, romance and edgy glamour. Walk further into the large recesses of Double Crown and you’ll come to an ante room with more tables and a “secret door” that leads to Madame Geneva, the bar next door. So with all this awesomeness, why the debate? Well, the vibe is refreshing, the place is gorgeous. The food is good, yes, the menu creative. But really, Double Crown is kind of like REALLY overpriced. The dishes are pretty tiny and by the time you’ve ordered a few of them plus a drink, you’ve easily spent $70. I’m all for a fantastic dining experience, but just stepping into this place will burn a hole in your pocket. Besides that, Double Crown can be really inconsistent on the actual food. Sometimes the fantastic ideas don’t follow through on the execution. Sometimes, they fail miserably. Like the spicy apple, lotus root, and lily bulb salad I had the other day. It just didn’t taste as cool as it looked. You have to be careful about what you order because there are a lot of artfully worded red herrings on this menu. And one more thing, the service here can be really iffy. The waiters and waitresses are slow, forgetful and yknow what, they’re really just kind of snobby. That’s not the kind of service you should be getting at $70 per head. So.. the verdict is out. I want to love you Double Crown but there are still a few things holding me back. Details: http://www.yelp.com/biz/double-crown-new-york Damage: $50-$70 for dinner with a drink. $30 per head for brunch. Disclaimer: I actually eat here relatively often and my intention is not to poo-pooh it. If reading this has piqued your palate or even if you’re just slightly intrigued, I would encourage you to check it out. 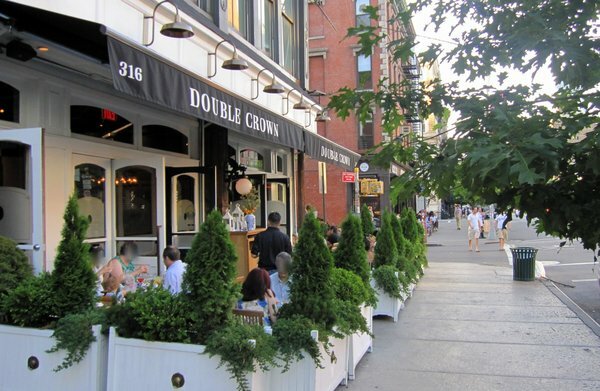 Brunch is a lot more reasonable, with a fantastic $20 pre-fixe ($32 with bloody marys), so consider grabbing a outdoor table and re-connecting with your inner hipster at Double Crown.